So I was recently doing my usual weekly shop and came across Jus Rol Pastry. I would never really bother picking up heavily processed food products as they are often full of additives, chemicals and are nutrient lacking, but for some reason, I decided to pick it up and check out the ingredients – and OMG – IT’S VEGAN!!!! I cannot believe I have been without pastry for over a year because I just assumed it had been made with dairy! So when I picked up Jus Rol and spotted that there were no animal products I was pretty excited. It even says “Suitable for vegetarians & vegans” on the box, which was a comforting confirmation. Ok, well, it was probably a good thing I hadn’t realised it sooner seeing as the ingredients are not exactly all that good for the body (in my opinion) as it contains gluten, margarine, emulsifiers etc. But, I decided I would pick some up as a one-off treat to settle my pastry craving! When I was a meat eater, I would frequently (almost daily even!) have two or three medium size sausage rolls for breakfast. 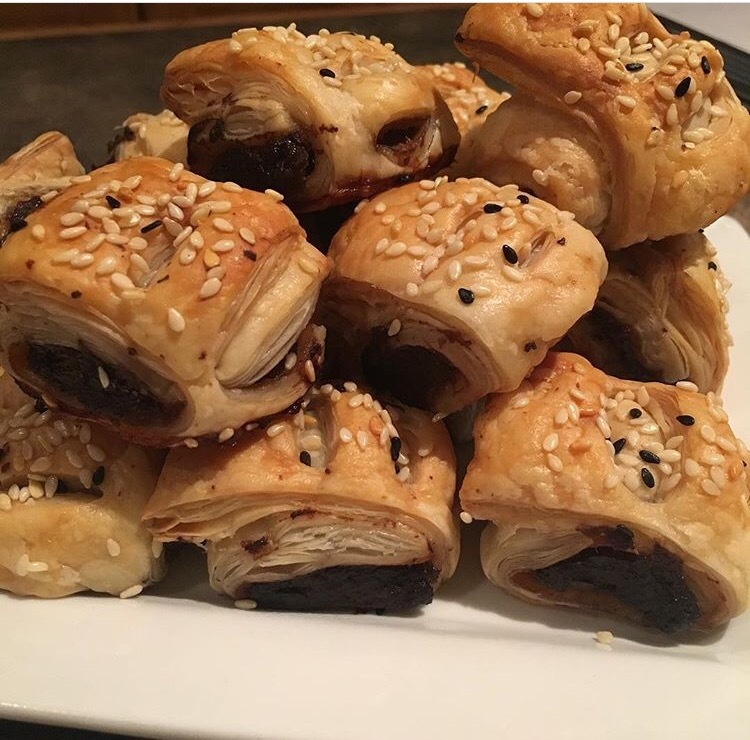 Now I no longer eat sausage meat (or any meat) so I decided to make mushroom rolls instead. Mushrooms are so great at imitating sausage meat. All you do is chuck them in a food processor and blend them until they form a paste. Then add in whatever flavours you like, the options are limitless! I have made beautiful Middle Eastern Mushroom Koftas (recipe coming soon!) and herbed variations of sausages (recipes coming soon!). I use Chestnut Mushrooms for this recipe as I believe they give the best flavour. They are full of great vitamins, minerals and phytochemicals, and are particularly rich in Copper which is great for energy as well as preventing premature ageing, and Pantothenic Acid (Vitamin B5) which is great at alleviating conditions such as asthma, hair loss, allergies, stress and anxiety, respiratory disorders and heart problems. This recipe will also work well with button mushrooms or portobello mushrooms, or a mixture of any of the above. This recipe makes 14 mushroom rolls at around 100 calories per roll. Some Melted Vegan Butter or Plant Milk for Glazing. Place all ingredients, except the pastry, into a food processor and blend until it forms a paste. Try not to over blend it as it will start to go watery, but if it does, simply add more chickpea flour to give it some more body. Lay out the puff pastry sheet on a tray and cut it to form individual pastry sections, one for each roll. How you cut it is up to you and depends on if you want little or large ones, but I usually make 6 vertical lines of equal distance apart and 1 horizontal line in the middle to make 14 mini pastry sheets. Spoon out the mushroom mixture onto the middle of each individual mini sheet, making sure there is the same amount in each one. You only want to take up space on about a third of each sheet as the rest will be rolled up. Once the mixture is in place on each, take the bottom third of the pastry on one sheet and roll it up over the mushroom mixture. Then take the top third and roll it up over that so there should now be two layers of pastry above the mushroom mixture. Be careful not to push down too hard, as the mushroom mixture may fall out the sides. If it does, simply squeeze it back in. Repeat this process for the other 13 rolls. Once they are all rolled up, take a sharp knife and poke a hole through the top two layers of pastry on each hole. This will allow the steam to escape from inside whilst cooking and will ensure all layers of pastry will cook through. Then gently brush each roll with a little melted vegan butter or margarine or plant based milk. This will ensure your rolls come out a delicious crispy golden brown. Finally, sprinkle over your sesame seeds which should stick easily onto the glaze. These are optional but I really love the flavour and texture they bring. Plus it makes them look really pretty too! I prefer the black sesame seeds but white ones work just the same. Bake the rolls in a preheated 200°c for around 45 minutes, or until golden brown. How long it takes really does depend on how good your oven is (mine is pretty rubbish!) so I recommend on checking them after 20 minutes and taking them out when they are golden brown. I usually enjoy these with some homemade ketchup and will be sharing my recipes for homemade condiments and dips very soon.